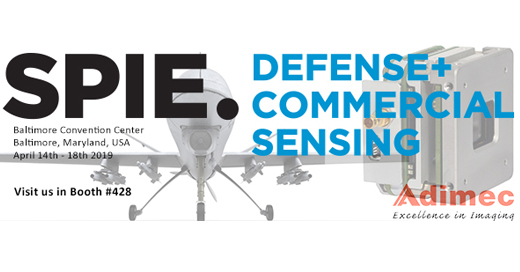 Boston, MA, United States – April 8th, 2019 — Adimec (www.adimec.com), a world leader in application-specific, leading-edge industrial camera solutions, will demonstrate TMX-55 camera at the 2019 SPIE Defense and Commercial Sensing Conference in Baltimore April 16th to 18th. The TMX series is designed for harsh environments. The TMX-55 performance temperature range is -40℃ to above +80℃ and is MIL-STD-810G qualified. The camera also has a small outline (44.5 x 44.5 x 31mm), is light-weight (under 115 grams) and low power (drawing under 5 watts). Adimec’s Video Enhancement Module technology being demonstrated at DCS 2019 shows superior contrast enhancement, using visible cameras with high resolution for greater visibility obtaining clear images despite environmental issues such as mist, fog, or low lighting. This greatly improves the possibilities for detection, recognition and identification capabilities in situational awareness, long range observation, and designator systems. For those looking to make the upgrade from CCD to CMOS without the costly process of overhauling system optics the TMX-55 features Adaptive Resolution™. Adimec’s proprietary Adaptive Resolution™ rescales the image size to the system required image format thus making it much simpler to upgrade. The CMOS pixels outperform CCD pixels of the same size with higher sensitivity, higher dynamic range, and equal MTF (especially for Bayer RGB color). This function also creates a virtual pixel format that has improved performance compared to the original sized pixel. The ability to downscale the image at the camera results in a lower interface bandwidth. Visit us in booth #428 on the exhibition floor to discuss and watch the TMX-55 video enhancement module in action!